As the fight between the Iraqi Security Forces (ISF) and ISIS in and around Mosul compresses, the high stakes of the operation and close-contact warfare are increasingly placing Mosul’s civilian population in the crossfire. The ISF is consolidating gains to the north and south of Mosul as it continues to contest neighborhoods in eastern Mosul. The Federal Police continued its advances along the western Tigris River bank, looking to breach the city limits through the airport. On the eastern bank, the Iraqi Army and tribal fighters recaptured several villages north of the Great Zab River from November 8 to 15, including the ancient Assyrian city of Nimrud on November 13. ISIS destroyed much of the fabled ruins, which it deemed idolatrous, in the spring of 2015. Meanwhile, army units are positioning to enter Mosul from the north after retaking Bahwiza and its environs on November 8. Inside the city, units from the Counter Terrorism Service (CTS) and Iraqi Army are engaged in over a dozen neighborhoods in eastern Mosul, announcing recapture of three neighborhoods in northeastern Mosul on November 12 and 13. The Popular Mobilization is moving to take the military base southwest of Tel Afar as a strategic stepping stone towards the city of Tel Afar, west of Mosul. The base could also serve as a launch pad for intended militia operations into Syria. The capture of the Tel Afar base would give the primarily Iranian-backed paramilitary force a major foothold in northern Iraq, adding to the Popular Mobilization legitimacy as an Iraqi security institution. The establishment of a formal Shi’a militia base in northern Iraq will likely increase the risk of sectarian violence and create conflict with both local Sunni Arab and Kurdish populations and with Turkey, the latter of which threatened on October 30 undisclosed action if the Shi’a militias “terrorized” the region. 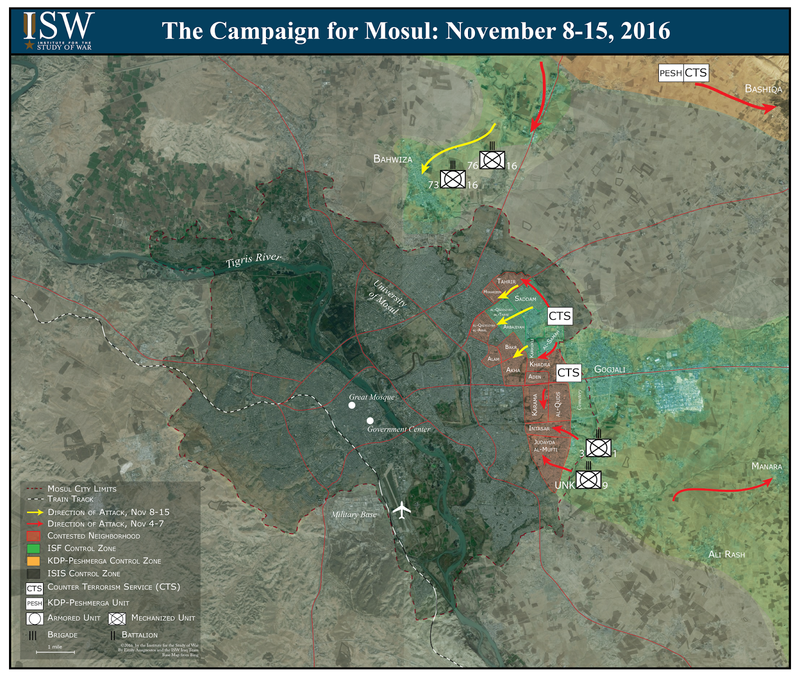 ISIS’s resistance has become increasingly brutal over November 8 to 15 in response to the ISF’s advance towards Mosul’s city center. Its defensive mechanisms include the use of the high number of civilians still living in the neighborhoods as human shields to slow and deter the ISF. ISIS has deployed snipers to rooftops of still-inhabited houses, denying the ISF the ability to call in airstrikes lest striking the families inside. ISIS has also been pulling civilians into the city from surrounding villages to be used as shields while executing hundreds of civilians accused of collaborating with the ISF. Meanwhile, Human Rights Watch (HRW) confirmed on November 11 that ISIS used blistering agents against both civilians and security forces in Qayyarah in late August. The report, following accounts of chlorine and mustard gas attacks in Bashiqa, northeast of Mosul, and the burning sulfur plant north of Qayyarah, underscores that ISIS will continue to use chemical weapons as part of its defense as well. The ISF and Peshmerga have also been accused of human rights violations, which could undermine the mission to defeat and prevent the reconstitution of insurgent groups in Iraq. Amnesty International reported on November 10 that men in Federal Police uniforms had carried out extrajudicial killings of accused ISIS members in towns south of Mosul, while HRW accused in a November 15 report ISF members of mutilating ISIS corpses and executing surrendered militants, both of which constitute war crimes. 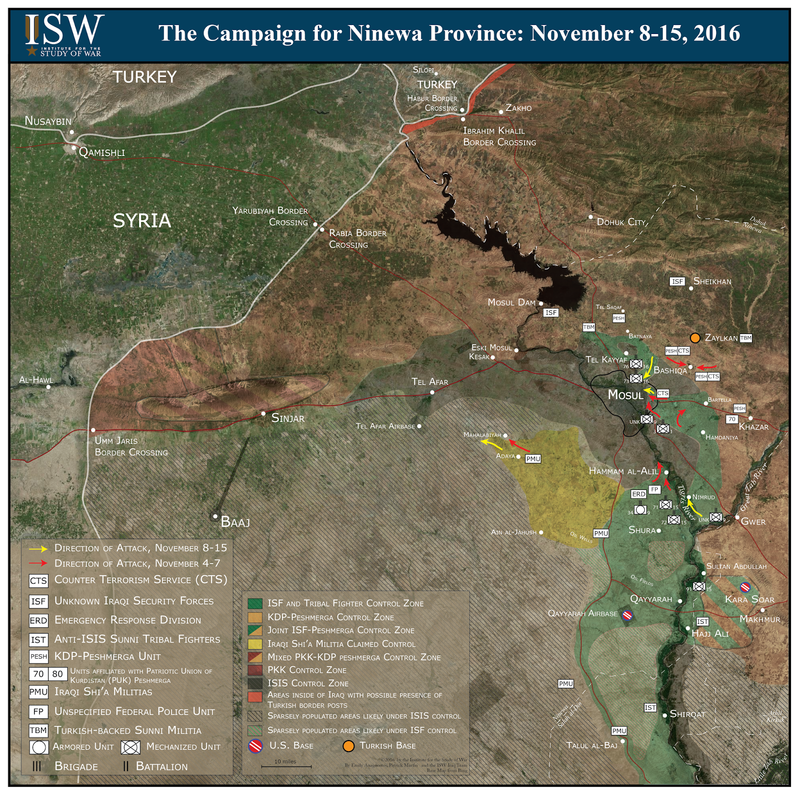 HRW also issued a report on November 10 accusing both ISF and Peshmerga officials of unlawfully detaining or disappearing suspected ISIS militants at screening centers and camps around Mosul. Officials from the Iraqi and Kurdistan Regional Governments have denied the reports. Nevertheless, reports of human rights abuses underscore the high risk that the violations will increase as forces move into the dense urban terrain and the line between civilian and militant blurs. If the ISF fails to prove itself a better champion to Mosul’s population than ISIS was in 2014, it sets conditions for another insurgent group to exploit the seams between civilians and the government and resurge in ISIS’s wake.